I’m writing this post as my family drives home from a day in Montreal where we served in a soup kitchen today. We drove there for the afternoon to help prepare a meal that people ate this evening. I’ve been here many times before, but this time was special because it was the first time my daughters came too. 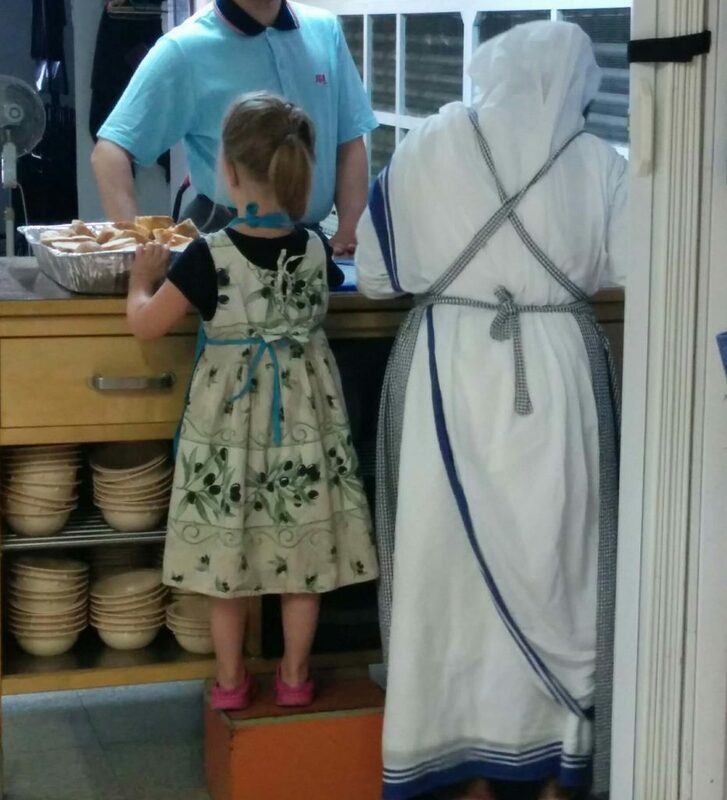 This was the first time my kids had been to a soup kitchen. As we walked in my three year old and four year old got their own little aprons along with the adults. They stood alongside us as we made dinner and dessert, helping as best as preschoolers can! When it was time to open the doors they ran to greet the people who came inside. As dinner was served the girls took their places. My four year old was serving dinner rolls, and my three year old was handing out bowls of fruit. Their tiny smiles and giggles were contagious and people obviously enjoyed their presence. The Missionaries of Charity run the soup kitchen here, and this is the place where I first learned to live with less. They run a soup kitchen where they serve anywhere between 80-120 people for six days every week. Considering there are only 4 sisters currently living there that is a lot of mouths to feed every day. These ladies live a life of complete trust in God to provide for their every need. As such, they do not fundraise or ask for donations. They freely choose a life of simplicity and trust that enough will be provided for them. They trust that other people will be moved to generously share, and that they will be taken care of… all while still taking care of other people on top of that. What a huge thing to reflect on: their commitment to freely choose simplicity in order to better serve other people. I always hope to remember this example every time I’m holding on to something ‘just in case’, or next time I’m hesitant to share.